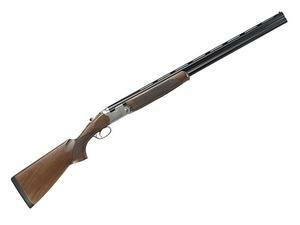 Beretta 686 Silver Pigeon I Shotgun 20GA 28"
Shotguns > Beretta 686 Silver Pigeon I Shotgun 20GA 28"
The 686 Silver Pigeon I hunting shotgun has all the functional features of Beretta premium over-unders at a particularly attractive price. At its heart, it has the best-in-class 686 action, which is compact and low-profile while being extremely strong. Whether you take it to an upland hunt or to the clay range, the Silver Pigeon I gives you the flawless performance and the classic looks of a Beretta. While not as elaborately decorated as Beretta premium shotguns, the Silver Pigeon I has all the elegance that you can expect from a Beretta. The oil-finished stock sports a beautiful and crisp checkering pattern, and the schnabel fore-end adds to the classic flavor of this over-under. The scroll-engraved receiver is a functional work of art in itself, with its interesting geometry blending perfectly with the stock and contributing to the gun’s graceful lines. This is a shotgun that has all the elements of a treasured heirloom, without the price-tag to match.